We all know how important sleep is – especially when we don’t get enough of it. One of the first steps to a good night’s sleep is understanding the whys and the hows of the process. 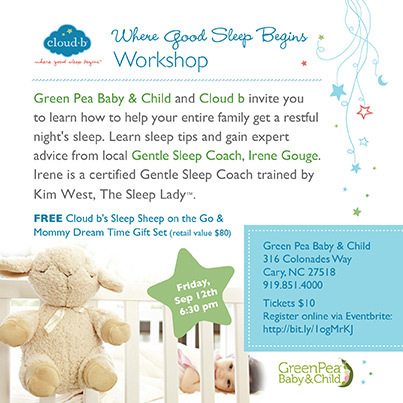 In this workshop I’ll share gentle sleep strategies and sleep expectations (children’s sleep is constantly changing! ), as well as help you understand why crying it out is not the only option for you and your child. I’ll also uncover the many ways gentle sleep coaching can be beneficial for your family. Fact: During the first six months, sleep can be challenging because your baby’s brain is not neurologically wired to sleep for long periods. This is why it is not recommended to sleep train your baby during this rapid time of growth and development. So what, then, can you do to help start laying these healthy sleep habits with your new baby? In this workshop I will share 5 action steps you can begin implementing with your baby immediately. You’ll learn the ways you can gently sleep shape your baby so that everyone is getting the rest they need. I’m sure since most of this information will be brand new to you, I’ll of course be available to answer any of your sleep questions and help clarify what you need to know for you and your baby. Space is limited, so grab your ticket’s here! Drowsy but awake- What’s the problem with too drowsy?